Our kitchen staff cooked us three hot meals every day. The food was sometimes excellent, mostly tasty and filling. For dinner, we always had a dessert too: often a freshly baked pie or cake. I don't know how they did it, but these were always excellent. 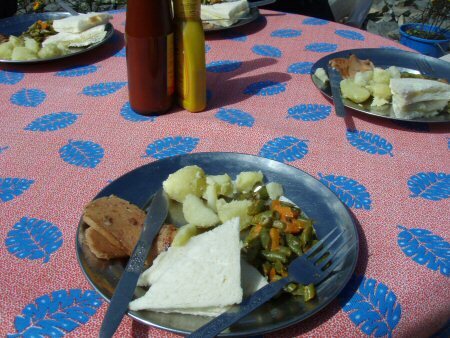 At higher altitudes the food was simpler. For instance, dinner might be rice and lentils, and desert might be heated canned fruit cocktail. Most of us also lost some or all of our appetite as we ascended. 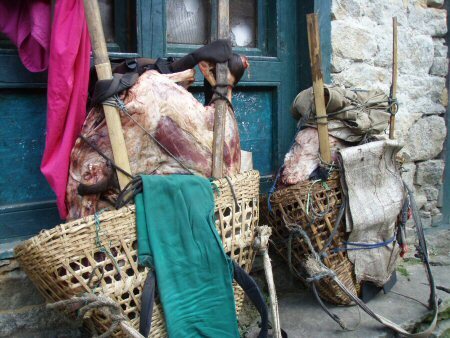 We ate a combination of food that had been carried by our porters, and things that were bought locally. Some of the food that we brought: spam, hot dogs, fish, pasta, rice, dal, porridge, crackers and cookies, tea and hot chocolate. Also desserts such as fruit salad, cakes, pudding. Food that was local: potatoes, potato pancakes, fresh vegetables, cole slaw, yak meat, chicken, apples. 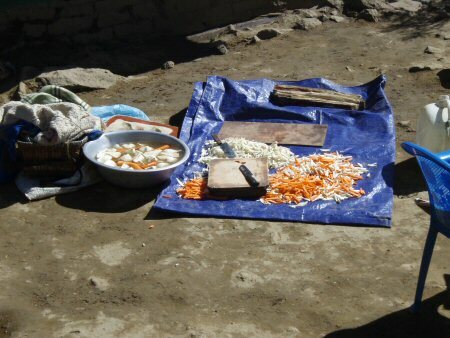 All along the way we observed local people harvesting food they had grown, and preparing it for cooking. Everything we were served was cooked (for sanitary reasons) leaving me with craving for anything cold and crunchy (salad).